BQM 258 When is a group too big to sacrifice? 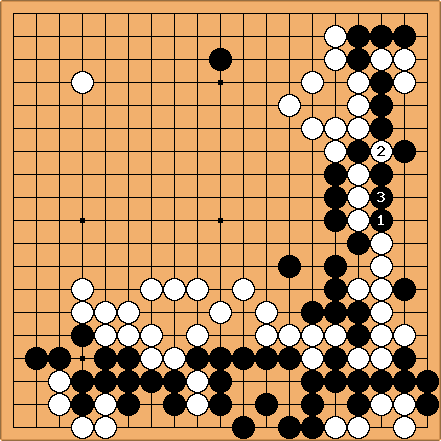 Thad: In the following game, Black has just won a fight on the lower bottom. however, in the process he has ceeded to White a lot of central influence. The question is simple. 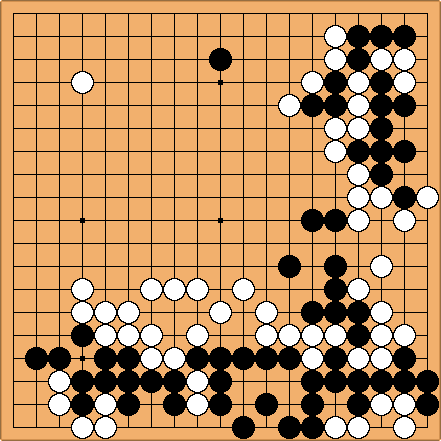 It is a difficult and complex fight to try to make the Black group in the lower right center live. By estimate, in Diagram 1, if Black lets the group die he still leads by 30. In Diagram 2 ( which is a few moves later ) he leads by 15-20. ( This is in hard cash only. ). Is it a viable strategy for Black to sacrifice the group? In sacrificing the stones, I do not mean that Black should simply not defend them or try to make eye shape. Instead I mean that Black should make moves which threaten to make the group live in a big way. Giving White the option to let the stones live, or kill them and let Black get a light group (s) in the center. If Black were to sacrifice which diagram would ber better. Clearly the damage is less in the first diagram, but sometimes adding stones to a dead group will allow you to make better shape with other stones. pwaldron (AGA 5d): This is my first-time major edit on SL, so feel free to correct things. In particular, what I had hoped would be captions under the diagrams are appearing beside the boards instead. Assuming Black gives up his floating group, White seems within spitting distance of Black on territory and has better thickness as well. The game may be playable, but I would certainly want to take white. Naturally there are several other variations, but I think there is enough aji here that White is quite restricted on how much resistance he can put up. Black has a good shot at connecting himself, and may even do so in sente if he can pressure White enough. Dieter: To pwaldron: your comments will appear next to the diagrams if you write these under the diagrams in the edit box. On another note, I think it's more correct to say that Black's territory doesn't compensate White's influence, because as you have pointed out, White is not thick at the right side, or not much thicker than Black. I agree that the possible battle there is the first thing to look at. Bob McGuigan: Also to pwaldron? : You can make the comments appear below the diagram by typing four per cent signs (line break) after the diagram.